I sell a handful of goats throughout the year and new owners invariably ask me what they should have on hand in their goat emergency first aid medical kit – just in case. I highly recommend having one of these, and I recommend even more vehemently that you should put it together BEFORE YOU BUY THE GOAT because, should you need any of the items in this kit, you’re going to need them RIGHT NOW, not when you’ve either ordered them over the internet, cadged them from a friend, or driven down to the store to see if they have any. Some of these things are Rx only, so you’ll need to get them from a vet, so do that in advance too. In fact, while you’re at it, register with a good livestock vet, because if you need one, it’s bound to be on a Sunday morning, and few will see anyone but existing clients when they’d rather be in church. 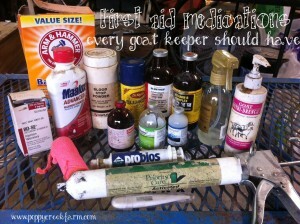 Don’t have a goat vet? Find one in your area here. This is by no means an exhaustive list, it’s just my personal recommendation and what I have and use. That’s the thing with goats; there’s so few goat specialist veterinary experts out there that we have all developed our own ways of getting by. We ask advice from fellow baa-tenders and we learn by experience. Ask ten goat keepers their advice on an issue and the chances are you’ll get eleven different opinions. BO-SE – in the event of floppy kid syndrome, or other symptoms of selenium deficiency, you’ll need to give a shot of this. Many people give newborn kids a shot at birth anyways. It’s Rx, so you’ll need to get it in advance from a veterinarian. Baking soda – In the case of bloat or other acidosis of the rumen, you’ll need this to restore balance. Maalox – great for an upset rumen, and essential in the case of toxicity through ingestion. Invaluable in the battle against diarrhea. Blood stop powder – pretty self explanatory. Always a good thing to have on hand, kids can knock off horn caps, which always produces more blood than you’d have thought possible, and any animal can sustain an injury. Blu-Kote – used after disbudding, but perfect to spray on wounds to prevent flies. Vitamin B complex – awesome pick-me-up, helps with appetite and rallying a sick animal. Wound spray – everyone has their own favorite antibacterial wound spray, and this just happens to be mine. But when I run out, this one is my go-to! 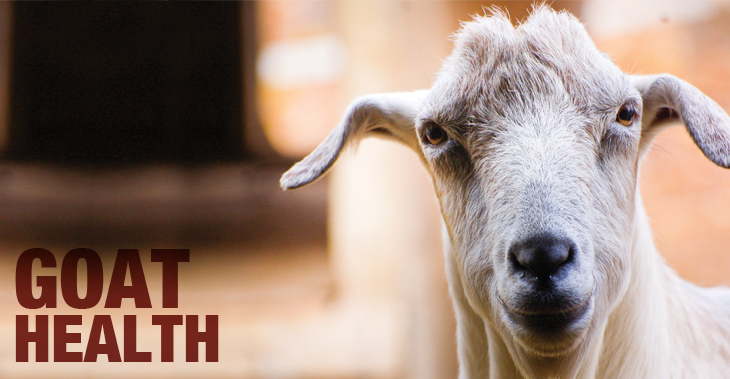 Goat Nutri-drench – good all-round boost for a goat not feeling 100%. I often give a dose of this after kidding. Co-flex bandages – broken legs always happen at a weekend when the vet is closed. This stuff can keep things stable until you can get them in the next day, thus avoiding an out-of-hours monster-charge. Ferrodex injectable – injectable iron. If you have an anaemic animal, this will help them fight it and get back on their feet. Banamine – expensive Rx painkiller. Totally worth the cost. It has literally saved lives for me. Can help stop the rumen spasms when a toxic substance has been ingested, sufficiently for you to fight the other issues. C&D antitoxin – a lot of people don’t keep this, I do. In fact, I ALWAYS have several bottles on hand in the fridge. I had a bad run in with mountain laurel several years ago, and it saved one of our girls. Hit a goat with it hard if you suspect entero. Probios paste – rumens need friendly bacteria to keep them running properly. This helps. Activated charcoal paste – neutralizes toxins. I’m toxin paranoid. Can you tell? Thermometer – it’s crucial to know when a goat is running a fever, especially a baby. Lactated ringers – not pictured, but I always have them. Another Rx from the vet. Keep it, because dehydration kills faster than you expect. When a goat is down and not eating or drinking, if you can keep it hydrated, you have a far better chance of fixing whatever is wrong with it. PenG – not in pictures. There’s few things this penicillin antibiotic can’t touch. It works very well on wounds, abscesses, URIs… you name it. Molasses – plain, old fashioned cooking molasses that you buy at the grocery store. A 1/4 cup in two gallons of warm water is the best perker-upper for a goat who just kidded, or perhaps one who got chilled for some reason. Will help to raise a temperature from the inside out, while giving essential sugars to help recovery – and that fact that it tastes yummy really encourages them to drink. 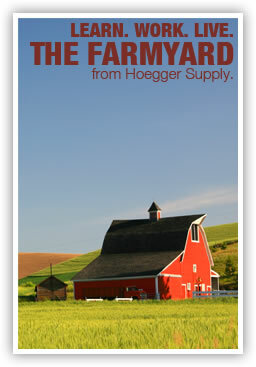 This is a post many of my goat friends and purchasers have asked me to compile, just as my personal recommendations. Of course, in an emergency situation, a vet visit is always the best course of action, but this comprehensive first aid kit should get you by in the meantime, or in the event a vet is not available. Katy Light owns and runs Poppy Creek Farm, located in Northwestern GA, where she raises Nigerian Dwarfs, Angora goats and sheep on her 45 acre farm.